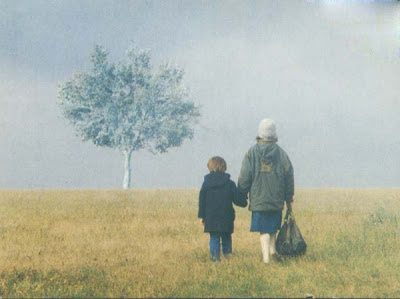 Landscape in the Mist, the final chapter in Angelopoulos’ ‘Trilogy of Silence’, was both a political film and a personal one. This mesmerizing, heartbreaking and hauntingly beautiful allegorical tale was a poignant portrait of the perennial yet futile search for identity and a compassionate father figure by the people of Greece, a country tormented along the better part of 20th century by political turbulence and disillusionment. The story chronicles the journey of two kids – Voula (Tania Palaiologou), a prepubescent girl, and her little brother Alexandros (Michalis Zeke) – in search of their father who, they believe, is residing in Germany. For Theo the destination was far less important vis-à-vis the incredible leap of faith that these two kids take with hope as their sole driving force. Along the road they face moments of gut-wrenching tragedy, as when Voula is callously violated by a truck driver, as well as simple joy, as in their motorbike ride with a young, lonely actor named Orestes (Stratos Tzortzoglou), and profound catharsis, as when Voula, who had been maintaining an impassive demeanour till then, finally breaks down in the arms of the young guy. The film was, therefore, also a fascinating coming-of-age tale – a personal one for the kids, and a political one for the rootless, disenchanted generation they symbolized. Washed-out vistas of Greek countryside, marvelous long takes, and the evocative score, laced the layered, lyrical storyline with pathos and melancholia, as did the devastatingly brilliant turn by the young Tania. Interestingly, the theatre troupe of The Travelling Players made a brief return in it, perhaps signifying the inherently cyclical nature of both life and history. Sohbet Thanx you admin nice movie.